Why we love it: Stave off germs and keep hands soft and supple with these Aloe Vera infused wipes. These natural disinfectant wipes from EO are 99.9% effective against most common germs and do no harm when absorbed into the skin or our ecosystem. Each individually wrapped packet is perfect for tucking away in a purse, carry-on bag or even for the gym. 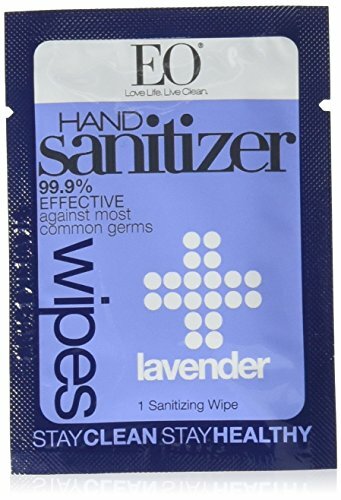 Disinfect your hands, airplane seatbelts, door handles, gym equipment...just wipe away! The only thing left behind is the soothing scent of pure Lavender essential oil. Comes in a pack of 24 individually packaged wipes. USDA Organic, certified gluten-free, cruelty free and zero synthetic fragrances or animal products.